The awareness of quad layer BDXL discs that can copy up to 128GB has been prevalent for years now, so much so that everyone thought the media was already available. In actuality, only the specification for the 4-layer 128GB optical disc existed. No one had actually produced the media for the open market until Sony recently announced their first release scheduled for November 2018. Only the tri-layer 100GB BDXL was readily available to this point. Sony surged ahead and will be the first to commercially offer the true quad-layer 128GB BDXL writable discs. The positive is that Vinpower’s BDXL Blu-ray duplicators (SharkBlu XL models), will be able to write onto those discs without an issue. 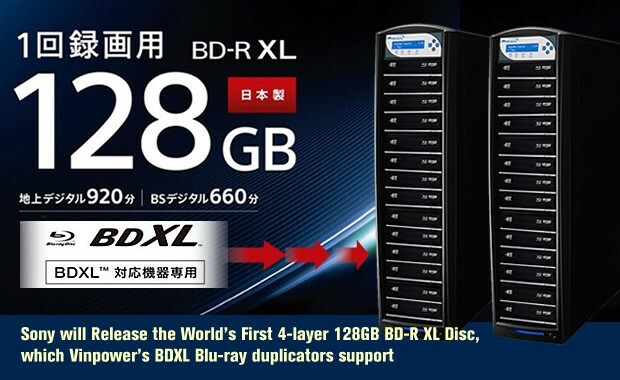 If you want to be an early adoptor and use the 128GB BDXL discs, then make sure you use the duplicators that have proven themselves time and again to be the most reliable duplicators on the market.